I picked up 2 of the 500 size for UL applications, they are smooth with a nice drag. Decent reel, definitely one of the best 500 size reels. I'm an old guy with a 20 min 5k time, I can keep the revo 16 at a steady 5 for an hour and hit 7 on a full on sprint. Once you hit a certain point with speed, doubling your effort doesn't increase the speed by much. 5 is fast on a kayak, especially if you can do it for an extended period of time, great for covering water or just racing through a rip. I have the smaller sail and have had fun sailing my 16. I'm not a skilled sailor, so I wouldn't do it with gear on board as I don't have AMAs. The smaller sail doesn't go as fast as the big one, but I was moving when the wind was strong, I can imagine that you will fly with the amas and large sail. That used to be "the" lure to use. Gulp has definitely crowded them out of the market. 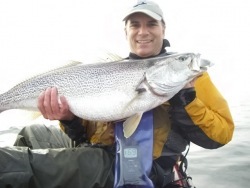 the argument for getting some on your list is that you can stand up and fish, but that isn't what you want to do. Take a long look at the revo 13, not the revo 11. For your size and where you plan on fishing, the 13 will be more accommodating, the 13 is faster and more stable. It's also faster than the other kayaks on your list. To improve the turning radius add a sailing rudder, it makes a difference. I generally don't use reverse, but fishing around bridges, you will use it more than most, so test each kayak you're considering in reverse as well. John is a standup guy. Why NY doesn't want someone who is dependent on a healthy striper stock to participate is beyond me. Short-sighted people have brought us to the present decline and now we should put them in charge? Getting distance is over rated. Last season I was fishing behind a surf guy. He was standing out past me and not catching, I was casting at the shore and catching. The double wides are great to throw when it is windy and you need a little extra distance, you have to downsize to the 10", the more compact baits will fly farther. Or use the 13" with a half ounce head. And seriously, stop casting so far! 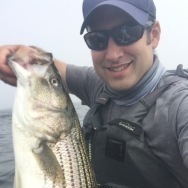 last year on the June full moon I picked up a 54# bass in Boston Harbor in the kayak. I've caught quite a few jumbos on the full. I would agree that the new moon typically produces better, but the big fish love those big tides. If I can fish, I'll fish! I only fish from 3 hours before a tide change to 3 hours after a tide change. Anything other than that feels like freshwater fishing. 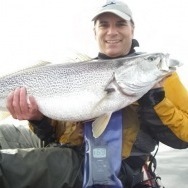 It's nice to have to search for measuring tapes that are big enough to measure stripers. I made my board 52" even though the tape is only 48" because I have goals! I've been through a few. I use mine in the kayak and have to use the timer most of the time which makes me have a different opinion than some of the above posts. Almost all my pictures are at night and all these cameras take crappy pictures at night. Nikon AW130--ok, way overpriced. Lots of bad pictures for every good one. You need to know how to set it so you can get the flash to work at night, seems weird for a camera with automatic settings to do a poor job with the flash at night. Mine now drains the battery when not in use (new battery too) and is useless unless I charge before going. Olympus Tough TG5--ok, way overpriced. Flash is better than the Nikon. The #1 reason I bought it was because you can set the timer to take a bunch of pictures instead of just one. Sounds like a great Idea and works occasionally. I had to send it back because of issues that I was having with overexposure. Part of the overexposure is that it doesn't use any auto settings in the custom timer mode. I have a ton of crappy pictures from this camera! They did replace it and now my pictures are often overexposed, but at least it isn't all white anymore. I'm inclined to buy a much cheaper camera next time, some of them are half the price of a smart phone and all they do is take a picture, usually not that well. I did a regression using moon phase, tide differential, and my fishing logs. While moon phase is correlated with tide differentials, my results were best explained by the tide differential. The larger the tide change, the better fishing was. My takeaway? I fish whenever I can and don't care about the moon phase or tide...I just want to fish.